Viewing topic "Looking for an arp for this sound"
I’m searching an arp that can create this kind of gate sound (hope is the right name of this effect). I’m no expert by any means, but I think that you would use a side-chain effect to achieve this. If anyone can offer any other ideas, I’m all ears as I am kind of curious how one makes this type of sound. The side-chain idea came from someone else. but I think that you would use a side-chain effect to achieve this. Yes. It is a product of side chain, and not an ARP. The synths you can hear bobbing up and down are all going through a compressor. That compressor has a side input called a ‘key input’ or ‘key listen’. A copy of the kick drum in the song is being sent via a bus to the compressors key ‘input’. The compressor is reacting to each kick beat by compressing the synths every time it hits and for the exact duration of each hit, and that’s what makes them bob in time. Side chaining is an ambiguous term because it has more to do with the signal path or connection, rather than the effect itself. I’d say ducking fits it perfectly. You’ll know ducking if you listen to any radio station. You’ll hear the presenter or DJ talk over some music, and the music will duck any time he talks and then return to the volume it was at when he stops talking. A copy of his/her vocal mic is being sent to the the key input of a compressor, and it ducks enough to allow you to hear the talking clearly over the music. OK, is a side chain from a compressor. And motif haven’t the right compressor to reproduce that effect. it’s not something you can achieve on your Motif XF with compression. 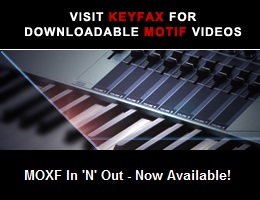 The Motif XF does have a compressor, but it doesn’t allow you to use a side chain input. You need to use a DAW with a compressor plug in and that compressor plug in needs to have a side chain input. I recorded a very short piece using Performance Direct Record. I then created a .WAV from that and normalized it. The normalized .WAV was imported into Integrated Sampling at C3 and stretched to cover C3~B3. A Voice was initialized, and the Waveform was used in Element 1. A saw-up Common LFO was applied. Keys C3-B3 will play. Press the ASSIGNABLE FUNCTION 1 button to activate the LFO. The ASSIGN 1 knob adjusts LFO speed. Details of LFO, Control Set Assign, AEG, FEG, etc., settings available on request. USR1 sound number 2 is an application of your thought, 5pinDIN (many thanks), and I used the same controls, AF1 and assign 1. It sounds cool, but alone. The first beat is just a little longer than the others, so it’s impossible to follow a drum. I tried even to use tempo sync of LFO, but no way at all. In USR1 sound number 3 I tried to use an arp, filtr ,7682. the first beat is perfect, but then the sound change, and I loose the side chain effect. may be using some different arp gate. I’m oriented to use this kind of arp, but this little delay is always present in this filtr effects.